Product Junkie Diva: Does it normally work for you. hmmm i mainly use bar soaps, i'll skip on dove then! I read your blog all the time but never comment but I just wrote a blog a few days ago about how much I love this product! Ren it may vey well work differently with your skin who knows, but the creamy version does not dry my skin. 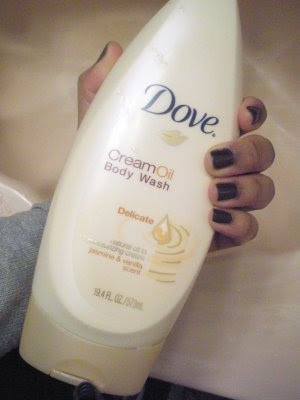 Amina Yes that was always my problem with dove until I tried this creamy version. I like dove body washes. Their bar soap has too much lye in them and leaves my skin feeling coated. Nope, their body washes and soaps irritate my skin. BTW- I love your blog, I read it pretty much everyday. Jewells ahh lye, good point.